Once upon a time, Microsoft experimented with an interesting type of online game. At preset times during the week, the game would become active and players from around the world could play and compete. That game was 1 vs 100, which was based on a television show. One lucky player would be “The One,” another hundred would “The Mob,” and everyone else was “The Crowd.” It was essentially the trivia game with each night having a different theme or topic. Players competed in real time. For The One, it was about beating the odds and getting a big prize if they succeeded, for the Mob, it was about beating The One and claiming some sort of prize, and for the Crowd it was all about seeing who could score the most points even if there was nothing to win. The best part is that a lot of players were visible, standing next to your avatar. It was like you were really part of a game show with other people. And then it got canned, which sucked because it was the best thing to ever happen to Xbox Live. If I recall one of the reasons for shutting it down was that it was pulling players away from other games, which is apparently bad for business. For the longest time, gamers like me who played 1 vs 100 religiously have waited for Microsoft to do something like it again. They still haven’t, but that’s okay because now we have Comedy Night. 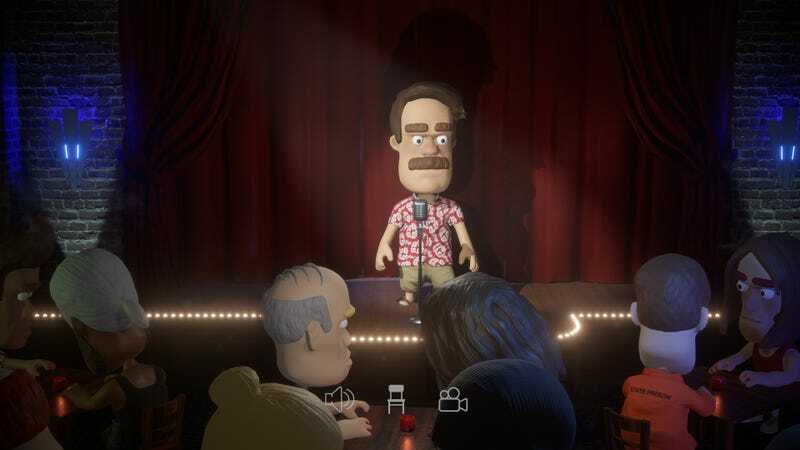 One or two players get up on a stage and try to tell jokes in front of a live audience comprised of other players. Those players, the audience, get to decide whose comedy career lives or dies with the push of a button, and that’s hilarious to just think about. There’s so much potential in “live” games like these to the point where it baffles me that not many people attempt it. They’re like sandbox games of old where players mold the experience themselves with little input from the developers. They’re provided a framework and then told to just run with it, and that’s what makes games like this so much fun. Anything could happen, so you just gotta go with your gut and do something. I can already see me and my friends giving Comedy Night a go every once and a while for a good laugh.